In a house full of teens we are always snacking on something. 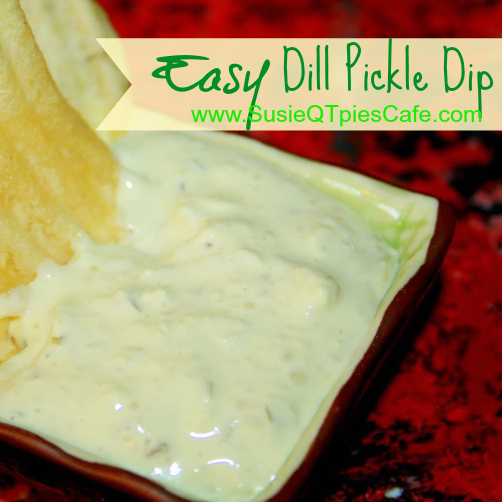 This is the perfect game day recipe dip because it is so easy to make and everyone who loves pickles loves this dip. This appetizer recipe is in one of my favorite cookbooks- Gooseberry Patch Quick & Easy Christmas. Mix together all ingredients except chips. Stir in pickle juice to get the consistency you want. Cover and chill 24 hours. Serve with chips. Serves 6-8. MY KITCHEN NOTES: I didn't read the directions before planning the dip so I made it on the day we needed to eat it. It was VERY TASTY and I wondered why you needed to wait 24 hours to eat it. We had leftover dip so I covered it and put it in the fridge. I pulled it out the next day and WOW I then discovered why you should eat it the next day. It was even better after the ingredients had time to form together. Very tasty and we will make this again, and again and again.